LPG (propane) consumption is based on the burner size or sizes of the appliance, as some have more than one burner. All gas appliances are rated by the manufacturers for gas consumption. They are expressed in either MJ/hr or BTU/hr, depending on which country you live in. The ratings are typically found in the product specifications. To calculate LPG - Propane consumption per hour for your gas appliance requires just simple arithmetic. You take the MJ/hr or BTU/hr ratings from the manufacturer and divide it by the relevant value in the chart above. If you have a heater that consumes 25MJ/hr, to determine the amount of liquid LPG (propane) it would consume, just divide 25 by the values in the MJ column of the consumption conversion chart. If you have a heater that consumes 14,000 BTU/hr, to determine the amount of liquid LPG (propane) it would consume, just divide 14,000 by the values in the MJ column of the consumption conversion chart. If you have an appliance with more than one burner, like a cooktop, just add the burner ratings together before dividing by the chart values. What is a Megajoule or MJ? Most people know that gas appliances are rated in Megajoules or MJ/hour. However, many people believe that this is a measure of output. In reality, it is a measure of the required gas input. Output is typically measured in kilowatts. The MJ inputs and kW outputs are directly related but are affected by the efficiency of the appliance. A BTU – British Thermal Unit – is an old non-metric unit of measure for heat. One BTU will raise the temperature of one pound of water by 1°F. BTU is used in the USA instead of MJ. Most of the rest of the world uses MJ. 1MJ equals 948BTU, so to get an equivalent number of Megajoules, just divide the BTU rating by 948. As mentioned above, the gas consumption rating is not the same as the heat output rating. For example, a 25MJ heater with a 5.8 Star energy rating has an output of 6.2kW. Now, if you do the maths, dividing 25MJ ÷ 3.6MJ, you would expect that the output to be 6.94kW, not 6.2kW. The difference is that, at 5.8 Stars, the heater is 89.3% efficient. No gas appliance is 100% efficient, which is why we have the gas appliance Star rating system to judge the relative performance of different models. Appliances aren't always used on the highest setting. For example, the popular Rinnai Avenger input is 25MJ on high but only 8.5MJ when set on low. Hot water heaters will also automatically modulate the burner down, once the desired temperature has been achieved. As a result, the consumption will be less than what would occur at the maximum appliance input rating. Some manufacturers provide the consumption specifications for the lower settings, so you can still do your calculations. 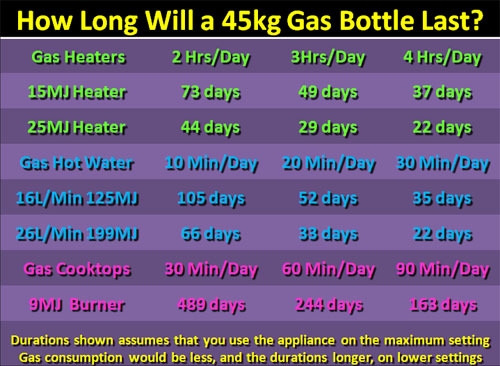 You can also use the consumption per hour to determine how long a gas bottle will last. For example, if you have a 45kg LPG gas bottle or a 100lb propane tank, you just divide by the kg/hr or pound/hr calculated values to determine how long the gas bottle will last.